When working with feature branches, you should open up a "pull request" in GitHub so that your team members can "peer review" your work. This is considered as the best practise! Create it so that it tracks origin/develop. 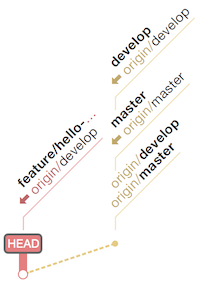 Branch feature/hello-world set up to track remote branch develop from origin. Push it to remote repository to open a "pull request". Writing objects: 100% (3/3), 313 bytes | 0 bytes/s, done. If you go to GitHub, there will be a notification bar that will ask you to open a new "pull request" for the feature branch you've just pushed. 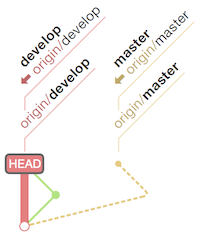 Open it by comparing it to develop branch, writing a subject and a description for it. At this point "peer review" takes place against the "pull request" in GitHub. If everyone in your team is happy with the work you've done in feature branch, you can merge it to develop branch in GitHub and delete it unless you need to do some kind of modifications to make everyone happy first. If all go well, then you can merge it manually by hitting "Merge pull request" button and and then hit "Delete pull request" button to finish off your work. Let's say you merged and deleted it in GitHub however, it only applies to remote repository. You must now reflect what you've done in GitHub to your local develop branch because it is behind remote develop branch. Delete local feature branch like you did in GitHub before. Deleted branch feature/hello-world (was 47645b3). Just to confirm that your local develop still doesn't have the merged changes yet. As we said above, all you have done was in GitHub, not in in your local repository. This confirms it! Update your local develop so it is up-to-date with remote copy. Just to confirm that your local develop branch is now up-to-date with the remote develop branch. This confirms it!